Reinhardt’s Office of Public Safety and the Cherokee County Sheriff’s Office will assist with parking and traffic flow. Graduating students should park in the Funk Heritage Center and East Hall lots. Commencement guests may park in any available parking space on campus with exception of designated handicap spaces, fire lanes, and the gym parking lot, which is reserved. Space is limited, so please encourage carpooling. If you or your guest(s) currently have a state-approved handicapped parking pass, you will not need an additional one from Reinhardt University. If you or your guest(s) need this accommodation but do not already possess a state-approved pass, please fill out the form below or contact the Office of Public Safety at 770-720-5789. 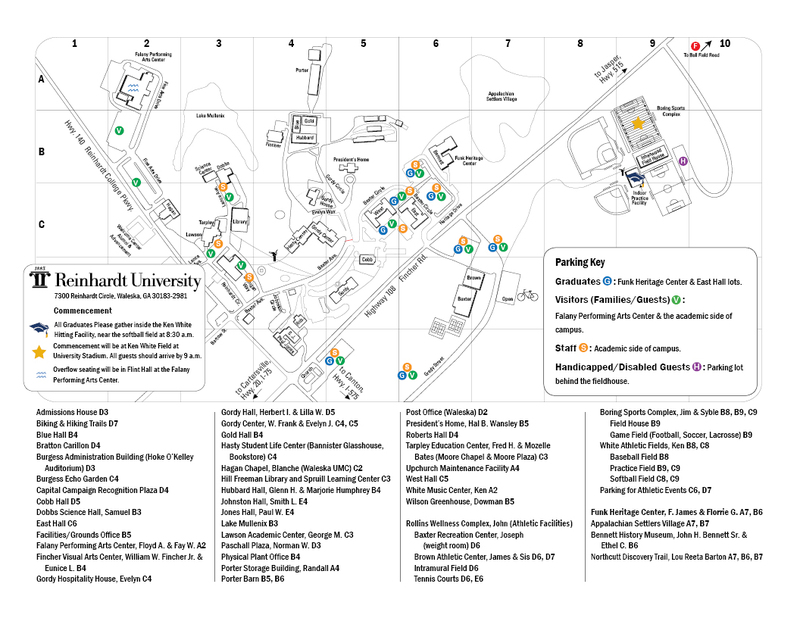 Disability parking is located on One RU Eagles Way, behind Isherwood Field House. (One RU Eagles Way will be restricted to handicapped parking only).